Hi, everyone. Had a wonderful day today. Went out with kids to buy bible study materials and I found a book that I adore in Popular Bookstore at Bras Basah Complex. Gosh... thank you God. You know what I truly love. In the midst of sourcing for bible study materials, God blessed me with another book on watercoloring. It's a book on watercolor fairy art. Gosh.. love... 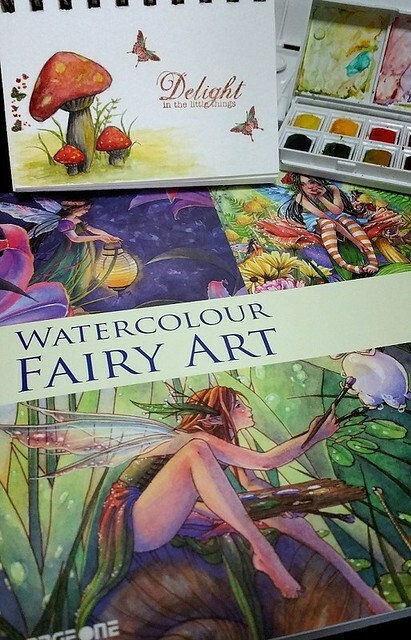 In the book, there's many beautiful artworks and tips on how to draw and watercolor fairies. I want to try!!!! But I think I need some time to learn how to sketch the fairies and the background out before I can do any watercoloring. Again I drew the outline of the mushroom clusters with a light coat of brown watercolor before adding darker tone and the colors. Then I drew the leaves and the shadows and grass patch. Love mushrooms!! It's one of my top favourite icons. Hee..
And now I want to share the cover of this Watercolor Fairy Art book with you. Here it is. Aren't the pictures beautiful and oh so tempting... can't blame me for getting it without thinking. LOL. The author drew out this fairies in pencil before she watercolor. It's not stamped out. Wow, right. I want to learn and draw. LOL.. hope it's not too great a challenge. I definitely need time to learn. 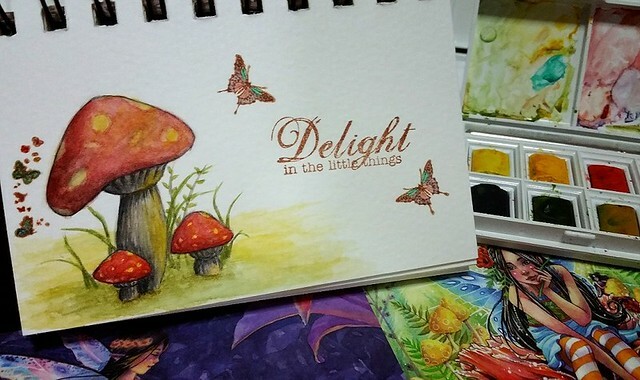 So in the meantime, do lookout for more mini watercolor fairy/mystical backgrounds.